Need help with your bathroom lighting? All of our retail store staff have been trained and are ready to help you get your bathroom lighting right. Alternatively, why not book a design service consultation with our experts. We are happy to work remotely with drawings or make a trip to the property for a live consultation. Just call your local branch for more details. The following are guidelines only for you to plan what lights can be placed in your bathroom. This is not an installation guide. Reference should be made to the IEE wiring regulations (17th Edition) or consultation with a qualified electrician should arranged. Bathroom lights are classified by an IP protection rating, and is always followed by two characters. One of our most popular products is the VEGA. The VEGA is an IP54 light fixture. The two numbers that follow IP, in this case, 54 refer to the level of protection and it is important that you choose fittings for your bathroom with the correct ratings. 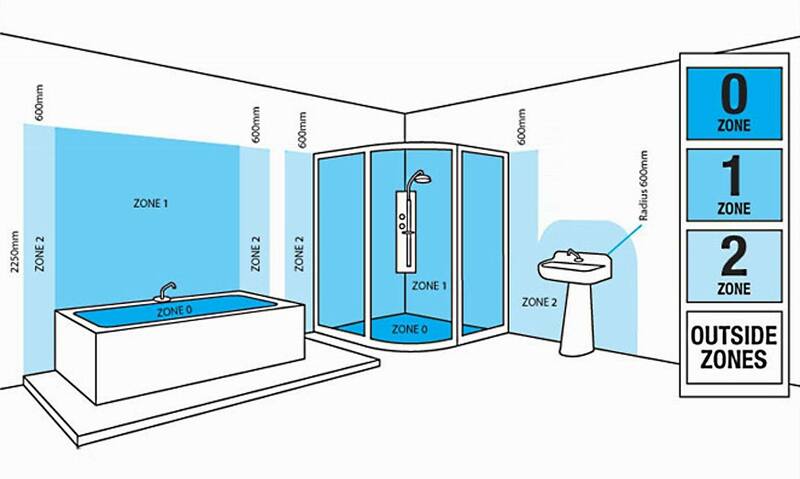 The image below demonstrates a bathroom area split into zones. Each zone requires a different IP rating. Zone 0 bathroom lights are for the inside of bath and shower trays. Any fitting that is used in this zone must be low voltage (max 12v) and be rated at least IPx7. Zone 1 lights can be used in the are above the bath or the shower to a height of 2.25m from the floor. In this zone, a minimum rating of IPx4 is required. If the fitting is 240v, a 30ma RCD – a residual current device must also be used to protect the circuit in this zone. Zone 2 bathroom lights can be used in an area stretching 0.6m outside of zone 1 to a height of 2/25m from the floor, the area within 0.6m the basin and inside the window reveal. In this zone and IP rating of at least IPx4 is required. In addition, if there is a likelihood of water jets being used for cleaning purposes in zones 1 and 2, a fitting rated IPx5 must be used. The second number is protection against fluids and is very important for bathroom fixtures. The definitions for this number are below. A mirror with integral lighting is the ideal combination bringing light directly where you need it but without glare. A mirror with lights adds a new dimension to a bathroom lighting working alongside ceiling or wall lights to create a pleasing overall effect. Some use LED and others have up to date fluorescent. Features may include motion detection, shaver power point, demist pad, inbuilt clock, cabinet or shelf layout. Colour options are available as white, chrome and satin nickel. Ceiling lights will ordinarily provide primary ambient light, to which may be added other light sources such as mirrors, wall lights and feature lights. Lights on either side or over the top of a mirror are an option and come in many styles from a simple shaver light upwards. Wall lights come in modern and retro styles and also crystal bathroom lights are now available. Some have an integral shaver power point.